In stock: Immediate shipment upon receipt of payment. Limited quantity! The Queen's Beast series of bullion coins depict the ten fantastic beasts of the British monarchy and the Royal Mint took its inspiration from the coronation of Queen Elizabeth II. These striking coins were designed by artist Jody Clark and the crowned Lion of England is the first in the series. The Lion of England has been one of the Royal heraldic beasts since the accession of James I and IV in 1603. 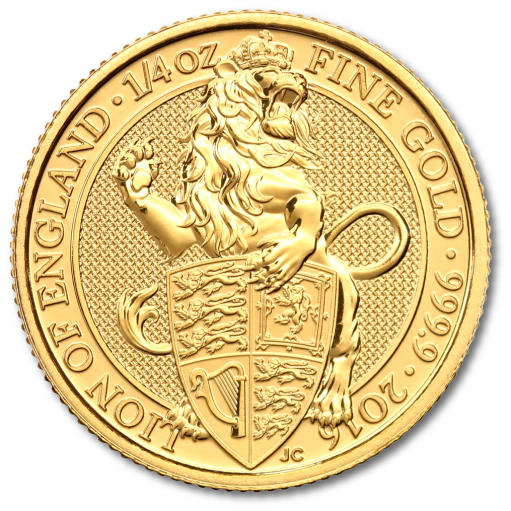 For the 2016 1/4 oz Gold Lion, Jody Clark has chosen to show the lion bearing a shield showing the Arms of the United Kingdom -the three lions of England, the lion rampant of Scotland and the Harp of Ireland - as used since 1837 during the reign of Queen Victoria. The coin's obverse features the definitive 'fifth portrait' of Queen Elizabeth II, also by Jody Clark. coininvest.com is delighted to offer its customers a series of bullion coins that is steeped in history and occasion. 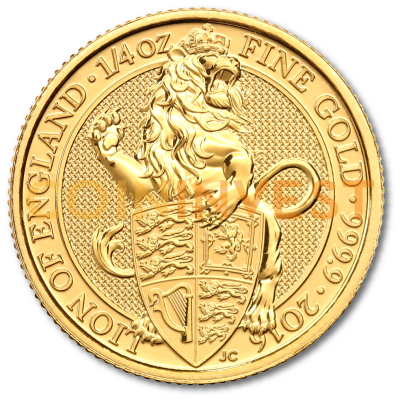 The 1/4 oz Gold Lion is an affordable option for collectors and it's also an easy way for investors to boost their portfolios with fine gold. The 1/4 oz Queen's Beast Lion is legal UK tender and therefore free from VAT and CGT exempt at coininvest.com - an added incentive for investors and collectors alike. This 1/4 oz is the perfect size for investing (I wish they made them smaller too!) the artwork is amazing and unique. CoinInvest did a great job getting these out to me and at reasonable prices. I've already gotten 4 Griffons, 4 Lions, and now I'm waiting on 4 dragons! Can't wait to see the other beasts! Superb design, almost justifies the cost difference for same weight other coins. i used mine to fill a blank sovereign dress ring. The 1oz version is just amazing.